What kinds of experiences stir emotions for the past within you? As a child growing up in southern New England, late September marked the beginning of autumn, which meant a trip to the local apple orchard and pumpkin patch. My family and I would often spend Saturday afternoon in the crisp fall air in search of the perfect apples and pumpkins to make pies and other delicious treats to snack on through the remainder of the year. For families around the world, the changing of the seasons ushers in a variety of traditions. Some folks take trips to lakes and beaches in the summer, go on adventures in the big city, or relax in the countryside. Others may not go anywhere in particular. They may make special meals during the holidays with friends or play board games together. For me, this time of year makes me think about these orchard trips with my family. 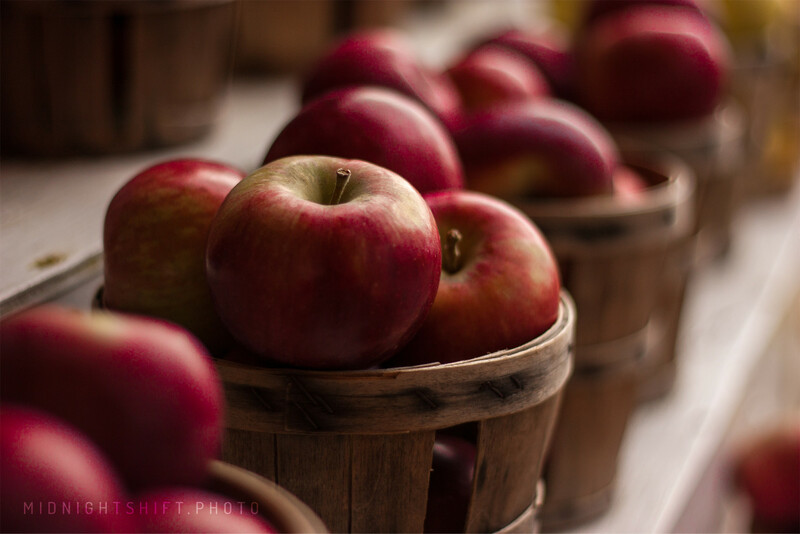 Looking at this photo of apples, from the Flying Cloud Apple Orchard in Acushnet, Massachusetts, I can almost taste the cider that was such a treat to drink when I was a child. Of course, nostalgia is something that affects everyone differently. We’d love to know what kinds of experiences you’ve had that stir these emotions for the past in you. For this challenge, show us what nostalgia means to you — perhaps a moment or scene that makes you feel wistful, happy, sad, or somehow longing for the past. It might be with friends, family, or by yourself — anywhere, anytime of year. We can’t wait to see your interpretations of this theme! Beautiful post, I love Autumn! It’s definitely one of my favorite seasons! Like your post. For me Autumn brings me both sadness and joy. Another year passing but a new one is about to begin. Always with New hopes. Great writing. Great framing here! Love the contrast and slight reflection of the pool water! Great shot Tom! Can you tell me a little more about this shot? What influence does it have on you? I had to lose weight, because when I entered from behind, the pony was lifted up. Carousels definitely bring on a sense of nostalgia for me as well! Great shot here! Awesome! I live on the coast of New England where one can see sailboats for miles in every direction! Great capture. It almost looks like a painting! Wow …. what a beautiful image!!!! Love apples. Great subject this week. Incredible artwork you create! Also, love your macro shots! Oh wow! These are amazing. How long have you been Crocheting for? Thanx 🙂 Not that long at all! Aw so many memories to choose from! I’m in that awkward stage of young adulthood though where I’m just now realizing how grown up I’ve become, and so now everything reminds of childhood.. I know the feeling 😀 ps. love your poetry! I’m sure a lot of folks do! It’s great writing. Thank you! You’ve got some pretty great photos yourself! Hi guys, Here’s my interpretation of this week’s challenge! Zee, thank you for sharing. Love the poem! I wrote a poem almost 10 years ago about the change of season, which asks: “Is it beauty or pain now attached to my soul? Is it grief, or relief, or nostalgia?” Emotions surface so quickly now, like the colors on these dying leaves. Thank you for sharing. Amazing poem and photos you’ve created. 🙂 I agree that autumn can bring out a wide range of emotions within a person. Now I want summer to stay 😦 Thanks for sharing! Those Lily’s are definitely difficult to grow in drier climates! I love love love Autumn. It was a toss up between writing about autumn or writing about high school. Why not write about both?! haha. And much like you, I also had a great time in high school full of joy every step of the way (well most, anyway!). Thank you for sharing your story! I’m not really nostalgic until I get some warm sand between my toes. Then, and only then, I miss lazy summer days. Have a great weekend! Oh! Your sunset shots are spectacular. I think I need to make it out to Spain and France! An apple of day,keep doctor away. Nostalgia to me is reading articles in which the author remembers his childhood places and the flora and fauna! And captures these in a pome’ or pun, a photograph or an oil painting done outdoors. I have my favorite Spot or two, too. I LOVE THE SAYING, “One is known by the company one keeps. I know my company is the stuff that bodies like WWF ,Green Corps and hundreds others are made of. All wanting to make their childhood dream come tru! Absolutely! I see on your blog you mention Thomas Marent. He’s one of my all time favorite photographers! His Rainforest and Frog books are two of my favorite of all time! Some of the most incredible macro shots I’ve ever seen! what a lovely prompt and your pictures are luscious. Thanks for sharing Yann! I particularly enjoy the shot of the old greenhouse that’s now an art gallery. To touch a bit on your post, It’s interesting to see that in more historical places there’s definitely nostalgia around every corner. But for who? Are folks still around to appreciate the history? That is a beautiful photo. The colors and softness are perfect, Jeff! Thanks so much! Have you ever been to the Netherlands, Jeff? This is amazing. I also have a small number of items and toys I’ve kept with me along the way. Emotions and memories always have a way of pouring through whenever I spend a minute admiring the trinkets. Thank you so much for sharing. It’s amazing you’ve had her for over 50 years! Those apples look delicious (no pun intended but I’m chuckling to myself). I can’t wait to start making applesauce and maybe a pie or two as well as other apple delights. Tasty entry for your own theme. Thanks Janet! I think my folks also have the 45 rpm records! I remember the robin hood one as a child! 560 Responses While this challenge is closed to new entries, we encourage you to visit the Reader to find other avid bloggers. Do What You Wish Child’s play. Nostalgia, you don’t know what you got til it’s gone. – Over Here. natashashilbhadra Nostalgia! This day, that year . natashashilbhadra Nostalgia! Those were the days .. Nostalgia – What's the Focus? Sky Blue Daze Who’ll Turn the Grindstone? TINY LESSONS BLOG The Beautiful Diversity of Being. Perspectives and (Analog) Nostalgia. Old city Gates of Jaipur – Jaipur thru my lens !! Women's Footwear in America The Man Behind The Photo. SoMuchToTellYou One More Day with You? Candles on the Front Porch Happy Birthday Jeremy! Giggles & Tales Weekly Photo Challenge – Nostalgia! Candles on the Front Porch Prophecy — Happy Birthday Scott! Life Is Like That Far away from home, make it memorable. My Quest for Peace – Pain(t)h.D. simply.cindy Deuce Days, Victoria B.C. Nostalgia! – Emotions that matter. Leanne Murphy What does ‘heaven’ mean? Nostalgia’s SunShyne – "Live Free & Love On Purpose!!" Cage Dunn: Writer and Author The Way It Was . . . This, that and the other thing Weekly Photo Challenge: Nostalgia…Make mine a 45. Biltong, Braai & Boerewors! Nostalgia? Lillie-Put Weekly Photo Challenge: What Takes Me Back?